You can use VBA to talk to Internet Explorer, providing that you understand the structure of the web page you're talking to. This blog shows how to do this! This is part of our full Excel VBA tutorial - Wise Owl also run courses in Excel, as well as classroom training in VBA programming. I've shamelessly stolen my colleague Andrew's idea to create this blog, showing how to fill in an Internet Explorer (IE) form from within VBA. I've also shamelessly borrowed ideas from Fergus Cairns - thanks, Fergus. We'll create a macro in VBA to fill in the search form on the old Wise Owl site (now superseded, but the principle remains the same). Note that our website has changed since this blog was written, so while the principle of the code shown below is still good, it won't work on our site. I've published a newer blog on the same subject here. In Internet Explorer 9, this is how you view source HTML using the right mouse button menu. 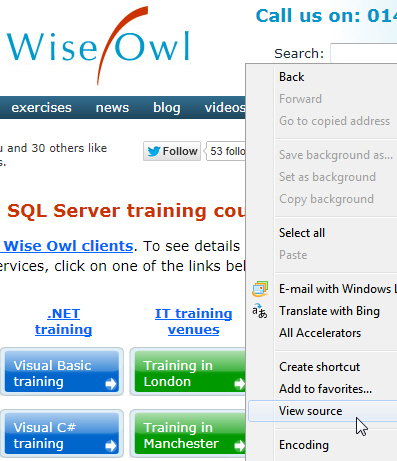 The HTML for the search button on the Wise Owl website. See the end of this blog for the BBC and Google UK search form field names. Now that we know what we're trying to look to in the Document Object Model, we can start writing our VBA. The next thing to do is to make sure that we can get VBA to talk to Internet Explorer. To do this, reference the object library called Microsoft Internet Controls (if you're not sure what references are, read this first). Choose the option shown from the VBA code editor (this example is for Excel). The libraries referenced always include Excel. The one you just chose appears near the top of the list. 'make sure you can see this new copy of IE! ieApp.Navigate "Wise Owl or other website address goes here"
ieElement(0).Value = "Excel VBA courses"
If you run this macro, it should search the Wise Owl site for information on Excel VBA courses! Except that it might not - timing is everything. You may need to delay your code to wait for Internet Explorer or your website to catch up - see below. It seems to be more or less guesswork how many you put in! So at the time of writing this (September 2014) the following code works - usually! Notice that I've put in a fairly random number of loops to slow this down!